Russia and North Korea have announced they will deepen economic and political ties under the banner of a “year of friendship” – a development that could further complicate the west’s attempts to deal with an increasingly belligerent Vladimir Putin and Kim Jong-un’s recalcitrant regime in Pyongyang. WASHINGTON – The White House, along with the Department of Energy’s Office of Electricity Delivery and Energy Reliability, say that some 679 widespread power outages over the past 10 years have been due to the effects of severe weather on the U.S. electrical grid system. The White House report, titled the “Economic Benefits of Increasing Electric Grid Resilience to Weather Outages,” said the cost of outages take various forms such as lost output and wages, spoiled inventory, delayed production, inconvenience and damage to the electric grid. But left unaddressed is the potential impact that an electromagnetic pulse event would have. In a just-published 28-page report, the White House said that severe weather has been the leading cause of power outages in the United States between 2003 and 2012, costing the U.S. economy up to $33 billion. An undeclared arms shipment found onboard a North Korean freighter will be investigated by a team of U.N. experts during a three-day trip, the Associated Press reported. The Chong Chon Gang in mid-July was stopped en route to North Korea by Panamanian officials, who thought the ship might have been carrying drugs from Cuba. A search of the cargo resulted in the discovery of Soviet-era weaponry that was reportedly being transported to North Korea so that the Asian nation could overhaul the equipment before returning it to Cuba. WASHINGTON — North Korea is upgrading one of its two major missile launch sites, apparently to handle much bigger rockets, and some design features suggest it is getting help from Iran, a U.S. research institute said Thursday. A successful satellite launch in December and a nuclear test on Tuesday, both in defiance of UN Security Council resolutions, have intensified concern that North Korea is moving toward its goal of building a bomb small enough to be fitted on an intercontinental missile. North Korea has confirmed that it has carried out its third nuclear test, after international monitors detected seismic activity close to the nation’s nuclear test site. The North Korean regime said it had “successfully” detonated a miniaturised nuclear device with “greater explosive force” in an underground test. This is the third test by the secretive regime in the last ten years. The first test took place in 2006, and was estimated to have a yield of only one kiloton. Today’s test is approximately seven times larger, and the miniaturised design of the device could enable it to fit on long range missiles currently under development. 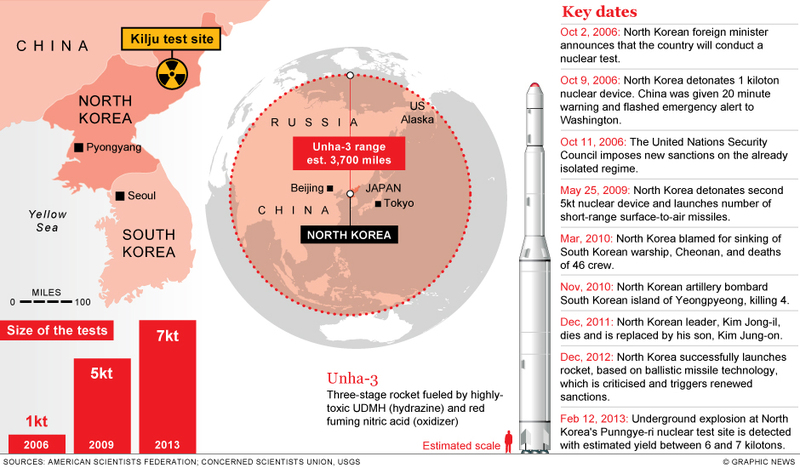 North Korea tested a three stage rocket last year which has the potential for reaching the far west coast of the US. 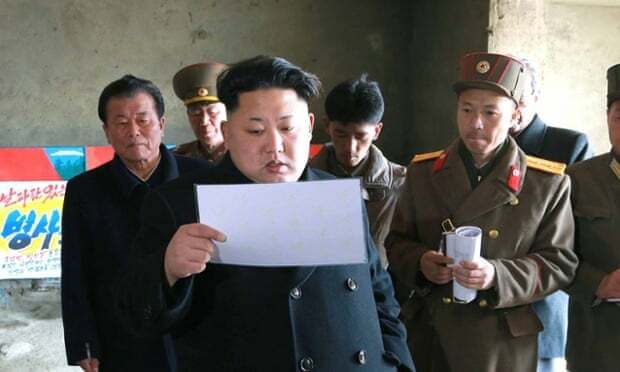 Two days after the United Nations condemned North Korea with further sanctions for its December rocket launch, the secretive country vowed to respond with a nuclear weapons test aimed at its “enemy,” the United States. The United Nations Security Council – including North Korea’s closest ally and biggest trading partner, China – voted unanimously on Tuesday to strengthen sanctions against North Korea for its Dec. 12 long-range rocket launch, which violated previous agreements with the UN. Two Russian anti-submarine aircraft have flown over a Japanese destroyer preparing to shoot down a North Korean rocket if it passes over Japan’s territory, a Japanese TV channel reported on Wednesday, citing the country’s Defense Ministry. According to the ministry, the Il-38 planes were seen on Tuesday off the south-west coast of the largest Japanese island of Honshu, where the destroyer is currently based. The ministry said that Japanese fighters accompanied the IL-38s during their flight.